JO205 is a visual reporting class for all journalism students at Boston University. Through weekly class meetings that include screenings, lecture, discussion, equipment instruction, in-class workshop and feedback sessions, students will gain experience in many aspects of multimedia storytelling, including audio production, shooting and editing photos and video, producing stories and publishing. This class is essential for those who have a passion for storytelling and a curiosity to find and dig deeply into compelling visual stories. The course has a deliberate progression to build skills through in-class exercises and assignments. While students will gain technical competency in multimedia production, the main objective is to learn and practice the fundamentals of reporting and visual storytelling. During the semester students will cover two stories in-depth, one of which is their final project. All stories must follow the rules of journalism to be truthful, fair, balanced, timely, and focused. Teamwork is also an essential feature of the course. Your partner will be a valuable asset to help with classroom exercises and peer editing. Your partner will also provide a second set of hands to help with equipment and be there to help keep you safe while working in the community. There are no prerequisites for this course. Any Boston University student may register with the permission of the instructor. This course offers an exciting opportunity for professional growth as students will acquire valuable visual storytelling skills, learn to take a creative approach to publishing original work to industry standards, to gain mastery of digital workflow and multimedia expression, and leave the course with an online portfolio. Throughout this course students will learn the fundamentals of photojournalism and video storytelling. Students will use a scaffold approach to build storytelling skills using a digital toolkit that they will work with throughout the course. They will learn to produce and manage digital assets, shoot and edit still pictures and video, and layer audio interviews with ‘nat’ sound to create rich multimedia stories. Students will produce and publish stories online. Students will develop skills and concepts to produce photo, video and multimedia stories in the area of their interest. 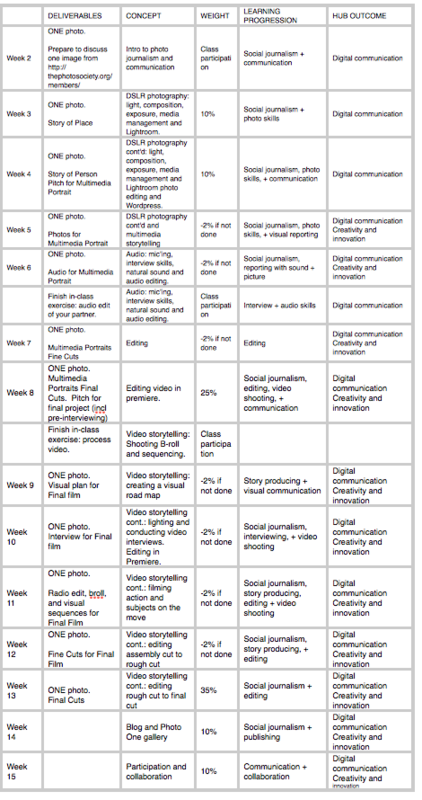 Students skills will progress during the semester through class exercises, assignments and in-depth reporting. Teamwork is an important component of this course. Students will learn to work with a partner and in small teams to assign tasks, strategize, provide support through peer editing and form crews that mimic media industry standards. Students will learn to step out of their comfort zone and communicate with people of different backgrounds. This communication skill will build during the course with class exercises, assignments and in-depth reporting. Students will need to find a creative approach in order to connect with their subjects and be able to recognize what stories and issues are unique and important to their community and report on them. Students will acquire creative skills as they learn to compose a photograph, frame a video clip, layer audio, create their story arc and edit and produce their final product. • Write detailed storytelling captions that include basic info such as who, when, where, and why. Students in JO205 are required to read the NYTimes, including the Lens Blog, daily. Students will also fulfill weekly in-class workshops that include pitching stories, photography, audio recording, video recording, and editing. ONE: One Photo. No Filter. Every day. This is a visual exercise that will help you build your storytelling and observational muscles. Take a photograph with your smartphone every day. Look for strong images that tell a story about the world around you. Every week you will upload your best photo to the class Instagram page with tags: #jo205b1, #dailyphoto, #bujournalism and @bostonu. At the start of every class, we will spend 10 minutes viewing and discussing photos/stories of the week. No sunsets, ducks, or squirrels, please. Plant yourself in one assigned location for at least one hour to tell a compelling story about the location and the people who are in the location. Plan to photograph your location either first thing in the morning or at sunset. Notice how the light changes as time passes. Demonstrate the skills we discussed in class: story, composition, exposure and focus. Organize your photos, import them into Lightroom, and select 10 images for the in-class critique and discussion. Once you’ve received feedback from the class, select five final images and upload to your WordPress portfolio and class Smugmug site. Each final image must show mastery of focus, exposure, and composition, and tell an interesting story about your location. Combined, the five images must deepen the story. Captions required. Extra points will be given for creativity and strong story ideas. Find a compelling person and tell us a story of that person through photography. Your final story will include 1) a tight portrait; 2) an environmental portrait; 3) a detail shot that reveals something interesting about the story. Demonstrate the skills we discussed in class: story, composition, exposure, focus, and DoF. Organize your photos, import into Lightroom, and select 10 images for the in-class critique and discussion. Once you’ve received feedback from the class, select five final images and upload to your WordPress portfolio and class Smugmug site. Each final image must show mastery of focus, exposure, and composition, and tell an interesting story of the person. Combined, the five images must deepen the story. Captions required. Extra points will be given for creativity and strong story ideas. Students are not allowed to shoot assignments of people they know including friends, roommates and relatives. This is the beginning of your work as a journeyman/woman multimedia storyteller. Work in teams of two to pitch a compelling, visual story for the Multimedia Portrait. Portrait ideas could include a story of a shopkeeper, athlete, or invisible worker. Photograph a series of images including portraits, photo sequences, details, and scene setting images. Demonstrate the skills we discussed in class: story, composition, exposure, focus, DoF, silhouette and motion. Organize photos, import into Lightroom, and select 10 images for the in-class critique and discussion. Extra points will be given for creativity and strong story ideas. Students are not allowed to shoot assignments of people they know including friends, roommates and relatives. Record an interview and ambient sound for your Multimedia Portrait to combine with your photo series. The final multimedia portrait will include a well-edited interview, ambience, strong images, and titles. You may also use music, judiciously. Include final end credits and upload to your WordPress portfolio and the class Smugmug site. Students will work in teams of two to research, report, shoot, and edit a focused character-driven story about a timely issue. Your story must have a news peg. Focus on subjects telling stories in their own voice without narration or an on-camera reporter. The final video will include a well shot and edited interview, visual sequences, and b-roll. Include titles, graphics, and end credits. You may also use music, judiciously. Upload to your WordPress portfolio and the class Smugmug site. No friends, roommates or relatives for this exercise. Students are not allowed to shoot assignments of people they know including friends, roommates and relatives. Discussion: Introductions. Overview of course, gear, and syllabus. Screen multimedia and discuss. 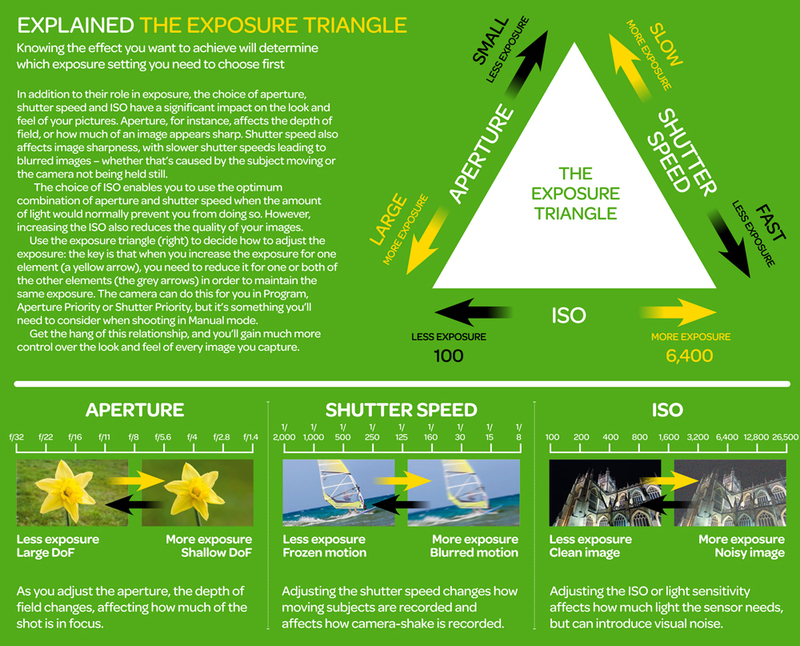 Image composition, focus & exposure. Journalism ethics, sources and defining a beat. • Bring your camera, laptop, USB3 external hard drive, and SD card to class next week. Workshop: Photograph place exploring composition, DoF and Shutter (freezing action and motion blur). Try jumps or similar action to freeze motion. Discussion: Pt. 1 Review camera menu, image composition, focus, and exposure. View and discuss several examples of photojournalism. Pt 2 Media management, importing into Lightroom, and organizing photos. • Photograph, media manage, and import Story of Place. Identify 10 strong images for review. • Read This If You Want to Take Great Photographs: pages 61-125.
Review and Critique: Story of Place. Workshop: Photograph a portrait of your partner, including a tight portrait, environmental portrait, and portrait with shallow DoF. Set up WordPress portfolios. Discussion: Class exercise: What is a story? Discuss story, sources, and how to prepare for pitch. View and discuss several examples of successful visual stories. Photograph, manage media, and import Story of Person. Identify 10 strong images for review. Prepare pitch for Multimedia Portrait. • Read This If You Want to Take Great Photographs of People: pages 1-42. • Bring your laptop and USB3 external hard drive to class next week. Review and Critique: Story of Person. Discussion: View and discuss several examples of photo essays and photo sequences. Discuss photographing stills for Multimedia Portrait. Discuss ethics and how images can be used to perpetuate racist and sexist narratives in media. • Photograph for multimedia portrait. • Bring a Zoom audio recorder, laptop, USB3 external hard drive, and SD card to class next week. Review and Critique: Review and critique photographs for Multimedia Portraits. Workshop: Record a 5 min interview with your partner. Discussion: Pt. 1 Discuss the art of the interview, scene sound, and room tone. Pt 2. Demonstrate transcription and creating a radio edit. View and discuss several examples of audio slideshows. • Transcribe audio interview of your partner and bring to next class. • Record interview and scene sounds for Multimedia Portrait. Transcribe your interview. • Reshoot stills for Multimedia Portrait, if necessary. Workshop: Audio editing workshop: Bring interview of your partner and transcript to class. Discussion: Discuss how to create a rough cut and fine cut edit. Adding room tone. Preparing stills for Premiere. Finalizing Multimedia Portraits with music (optional), lower thirds, titles, and end credits. View and discuss examples of successful portraits. • Fine Cuts of Multimedia Portraits uploaded to class folder before class. • Bring your camera, audio gear, laptop, USB3 external hard drive, and SD card to class next week. Video storytelling: Shooting b-roll and sequencing. Editing video in Premiere. Workshop: Film, record audio, and edit your partner during a process. Examples include working on the computer, tying a tie, and walking. Film establishing shots, WS, MS, CU, and ECU of the process to compress time. Discussion: View and discuss camera settings, video b-roll, sequencing, and filming a process with natural sound. Discuss MediaStorm’s 4-15 rule. • Final Multimedia Portraits uploaded to class folder before class. • Finish edit of process video and upload to class folder before class. • MediaStorm Field Guide, Chapter 3: The Video Interview. Mid-semester student survey. Discussion: Discuss elements of a visual plan and how to create a visual plan with a sequence document. • Each student picks one short doc (less than 5 minutes) to screen and discuss in class. Two volunteers bring one set of equipment to class: camera, audio, light, and tripod. Video storytelling cont. : lighting and conducting video interviews. Transcription. Editing in Premiere. Review and critique: Student led screening series and discussion of short films. Workshop: As a class, we will choose the best location for an interview, set up audio, lights, and camera. Discussion: Pt. 1 Conducting video interviews, interview lighting, sound, and team communication. Pt 2: transcription and editing video in Premiere. • Film an interview with your subject, transcribe it, and output 1 minute for in-class review. Workshop: Film your partner on the move practicing handheld camera techniques. Discussion: Filming action and reaction. Filming with a tripod vs handheld. Review of video b-roll and sequencing. • Radio edit of Final Project. • Film and organize b-roll and sequences for final project. • Bring your laptop and USB3 external hard drive. Review and critique (after workshop): Screening of final project rough cut 1. Discussion: Refining the edit of Final Projects. Discussion: Finalizing the video edit. • Upload Final Cuts to class folder before class. • Bring your laptop, USB3 external hard drive, and SD card to class. A Excellent work that meets or exceeds the requirements. Work reflects solid research, skilled interviews, is accurate, has proper attribution, conforms to industry standard; multimedia elements (video, photos, audio, interactive) are sharp, focused, clear, appropriately edited, properly captioned, tagged and credited. Could run as is, or with very minor edits. B Good work with a few errors. May contain minor problem with focus, spelling/grammar, style, balance, organization; several multimedia elements are subpar (out of focus, poor sound quality, etc.) or exhibit one or two technical glitches. Could run with some editing. C Average work. Failed to meet some of the requirements of the assignment. Shows lack of news judgment, accuracy, balance, etc., technical errors, subpar multimedia elements, poor selection of interactive elements. Could only run with significant editing or a complete overhaul. 10. Do not engage in harassing behavior of colleagues, subordinates or subjects and maintain the highest standards of behavior in all professional interactions. BU policy on recording in classes.